Usually, I’m a very clothing driven shopper. Keep the shoes and accessories basic, and let the clothes do the talking. As we enter this new season, I’ve been seeing a lot more statement shoes and accessories in lieu of a statement blouse or clothing item. I touched on this point in my winter accessories post, but I love the idea of statement accessories. I’m starting to change my ways. Let your accessories do the talking in your outfits. It allows for a much more versatile wardrobe. I haven’t intentionally done this, but my closet is primarily neutrals: white, ivory, camel, grey, navy and tons of black (forever a New Yorker at heart?). Statement accessories let one basic, white blouse be worn numerous different ways: pair it with a printed scarf, statement necklace or powerful shoe for three totally different outfits. As I start to think about leaving for college in the fall, I think this approach is a great way to achieve a defined style with a variety of outfits without feeling like it’s necessary to buy a ton of new pieces each season. Its an easy way to stay up-to-date on the latest trends, too, because buying a small accessory to “test” the trend is a lot less of a commitment than buying a trendy dress or blouse. This method is great because you can invest in some nicer quality basic pieces to wear all year, then buy a few fast fashion (ZARA will always be my weakness), trendy items and accessories each season. This spring, I think there is a big push for accessories in general. In particular, I’ve noticed that there are a lot of emerging shoe trends. Maybe I just wasn’t paying attention before, but I feel like shoes used to be very basic. 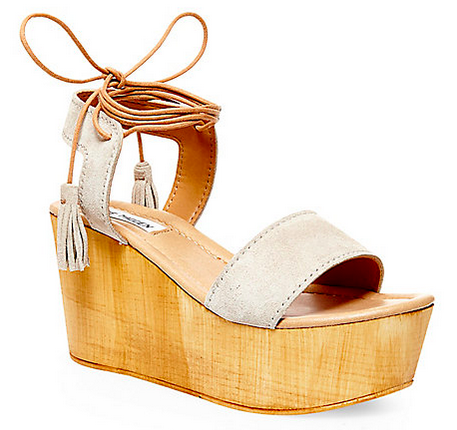 The essentials: basic leather sandals, boat shoes, white sneakers, wedges and heels. All very basic. Sure, there were more trendy and detailed variations of these shoe types, but overall shoes were fairly plain and meant to be versatile and paired with everything. Now, the shoes are doing the talking. Instead of pairing your neutral shoes with a statement outfit, the roles are reversed. What shoe trends are you loving this season? Comment below! ‹ PreviousGLOSSIER: SKIN FIRST, MAKEUP SECOND.